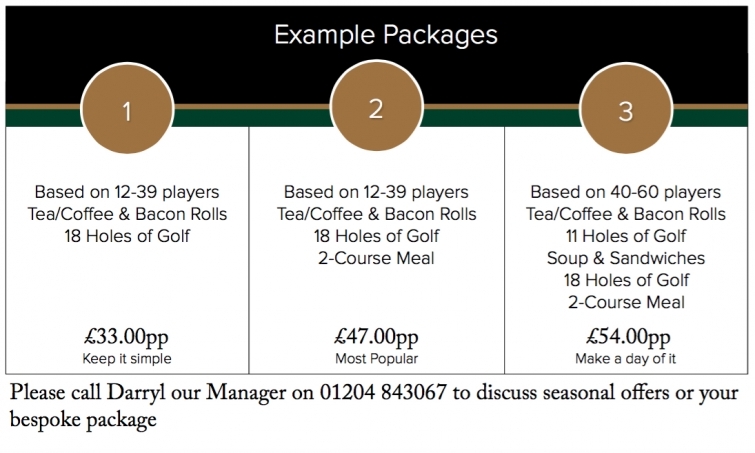 Bolton Golf Club provides a selection of golf packages which can be tailored to your own personal requirements. Please complete the email enquiry form below and we will respond with a quotation. Our green fee rates are discounted for Societies depending on the number of players you bring - Societies can pay as little as £26 per round per person (subject to terms & conditions). Click here for more details and to download our booking form with full terms & conditions. Choose from either the standard Visiting Party menu or the set Dinner menu (additional cost applies) - All of our food is sourced from the finest local suppliers and cooked fresh by our experienced catering team. If you do not see something you like, please ask as we are happy cater to your needs. Take the stress out of your day and let our Professional staff handle all your administration. The team will issue scorecards prior to the round and collect them on completion of play. Cards will be checked and the scores recorded on a results sheet. Cost per player £3.00. This additional service is a winner with societies. All players in the society will have their golf swings recorded on the first tee and then played in the clubhouse before dinner. One of our PGA Professional's will be on hand to provide your guests with advice on their golf swing. £30 per one hour post round analysis. "We have held our golf day at Bolton for the past eight years. That speaks volumes. The course is always immaculate and the staff friendly and attentive"